This vegetarian chili has become a perennial fall favorite in my home. It's a great make-ahead dish for parties, and leftovers freeze well for ready-to-go meals later. It's a fun way to get your children to look at pumpkins a new light. If you're feeling ambitious, present it in a hollowed out pumpkin—perhaps with a jack o'lantern face drawn on it with marker. 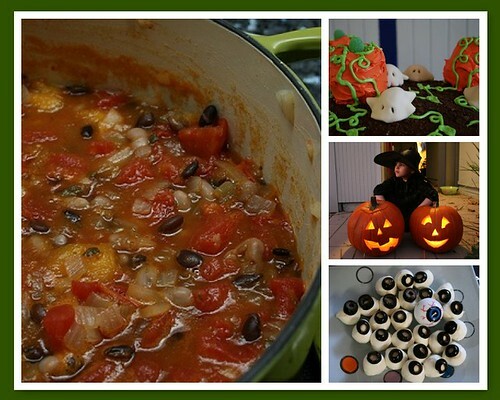 Hearty and filling, this will help fuel your family through a night of Halloween haunting. Heat oil in a Dutch oven or stock pot over medium heat. Sauté onion and garlic until softened. Add pumpkin and chile and sauté 2 minutes more. Add tomatoes, vegetable broth, beans, sage, and salt and pepper to taste. Simmer, covered, for 45 minutes. Serve topped with toasted pumpkin seeds, if desired.